Acoustic Energy made its reputation first in the 1980s, with the tiny but costly AE1, which was arguably largely responsible for the widespread adoption of metal-cone main drivers and the rebirth of the high-quality standmount. The company has gone through numerous changes since then, and ownership has moved to the Far East. Although the company headquarters and some production remains in the UK, less costly products, including the attractively curvaceous mid-price Aelites, are made in Malaysia. 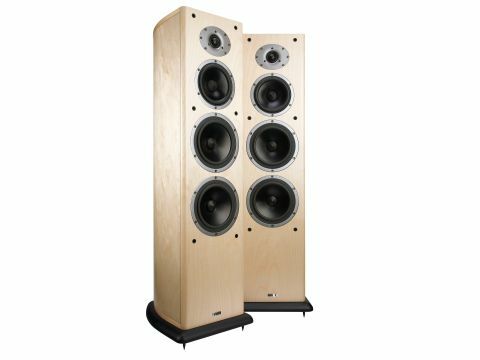 This £750 per pair Aelite 3 first came under scrutiny a couple of years back, and while it didn't disgrace itself on performance, it didn't really shine either. It was therefore something of a surprise to find it coming back for a second time, apparently unchanged, though this resubmission was a very wise decision on Acoustic Energy's behalf. This solidly built and reassuringly hefty three-way floorstander sells for £750 per pair, very reasonable in view of an impressive combination of four quality drive units, 18kg of total weight and curved sides, all covered in a real wood veneer. Curved sides are both fashionable at the moment and highly functional, helping disperse internal reflections and standing waves, as well as stiffening the 15mm enclosure sides. There's additional internal horizontal bracing, too. The enclosure is much narrower at the back than the front, and is finished in a choice of black ash, birch or cherry veneers - not the most attractively figured, for sure, but real wood nonetheless. The icing on the cake is a suitably solid plinth that extends the footprint and uses proper 8mm spikes with real lock-nuts, ensuring good floor coupling and stability. The three metal cone drivers have AE's pointy dust caps: the two bass units have 165mm cast frames and 118mm cones; the smaller midrange driver uses a 140mm frame and 95mm cone. The tweeter has a 28mm soft fabric dome. No fewer than three ports line up on the back panel, plus two pairs of terminals, and there's a bunged cavity for extra mass loading if desired. As soon as they were connected up, it was obvious that the Aelite 3 is a genuine class act, and clearly among the best of the models assembled for this group test. The question that then needed answering was "why it hadn't performed better first time around?". The answer is most clearly and incontrovertibly seen in the lab test results, and the belated discovery that the initial pair reviewed in 2005 had probably been fitted with faulty crossover networks, which is obviously not the case two years later. Most significantly, perhaps, is the exceptionally fine neutrality and attendant low level of coloration. With the speakers sited well clear of walls, the sound has plenty of weight, possibly a little too much for smaller rooms perhaps - but the option to block any combination of the three ports gives great flexibility. And while the bass end is certainly weighty, it's also impressively smooth and even (with the ports open). Stereo focus is another major strength, and any enclosure coloration is very well controlled, ensuring fine transparency, too. However, while the top end is smooth and well ordered, it lacks some incisiveness, and this clouds transient fine details. Speech is particularly clean, open and natural, showing remarkable similarly to a BBC LS 3/5a monitor, a hard benchmark to beat.